Sterling, VA. – April 26, 2017 - Natural Insight, a leader in enterprise cloud and mobile applications for retail merchandising and workforce management, announced its new Workforce Health features which help tackle one of the biggest challenges for employers – finding and retaining high performing workers. Each worker in Natural Insight is now assigned a 1-5 Workforce Health score. The score uses a proprietary algorithm based on analysis of 34 million work assignments, as well as evaluates individual historical performance. 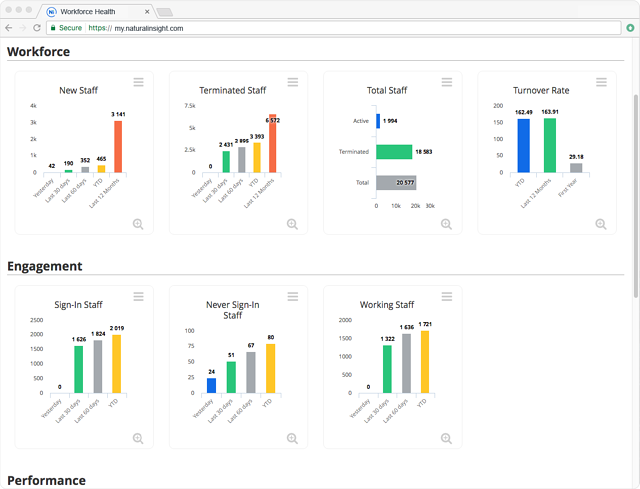 With Workforce Health , employers can access metrics related to their workforce and analyze performance, engagement, and productivity trends in a sleek, visual dashboard. Employers can offer new assignments to workers based on their Natural Insight rating, which creates more opportunities for those who have a successful track record. In return, employers build better, more effective teams and improve the quality of their field execution, translating to less store re-visits, improved compliance and an increase in sales. Workforce Health also lets employers measure how their hiring strategies are performing by providing visual data on hiring trends and turnover rates. With this information, employers can see if they are getting the most out of their recruitment dollars. 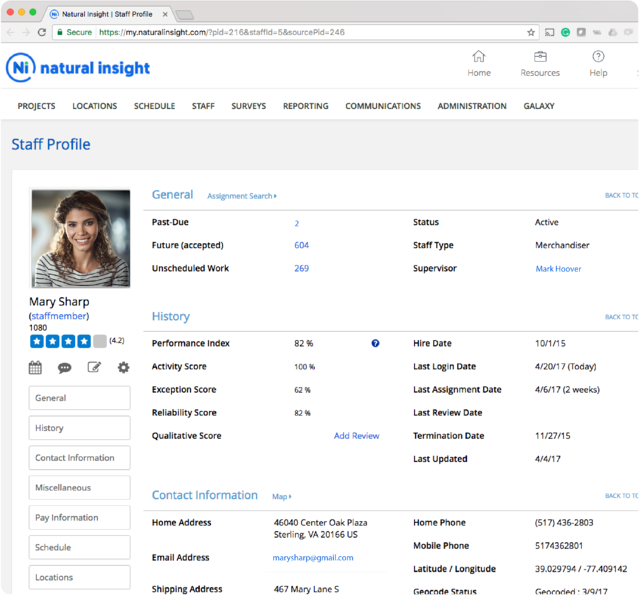 Natural Insight is the enterprise platform for delivering perfect execution through enhanced staff communication, on-demand staffscheduling, integrated timekeeping, project management and Reveal Analytics. With its mobile WorkTrak app, the company enables workers to be more productive, anywhere at anytime, creating a seamless field data collection experience. Benefits to companies include cloud-based technology that can be set-up in just days, robust reporting tools and a dedicated account manager for personalized customer support. “In today's gig economy, using actual job data in addition to performance reviews to assess performance will be a game changer when building a reliable workforce. And we intend to deliver more innovation to the market in the coming year. With machine learning and predictive analytics, the possibilities are endless,” added Midford. With over 34 million assignments managed, Natural Insight has collected in-store execution information on behalf of hundreds of brands in over 120,000 stores across North America and around the world. Natural Insight is quickly becoming the industry’s largest visual verification platform with more than 1 million photos captured and verified monthly. Merchandisers, product companies, marketing agencies and retailers in over 20 countries rely on the Natural Insight cloud-based platform to improve retail execution and reduce costs. Natural Insight leads the industry today with fully integrated mobile and Web-based staff scheduling, timekeeping, task management, field communications and analytics. Natural Insight is privately held and headquartered in Sterling, Virginia with offices in Toronto, Canada and Birmingham, England. Visit naturalinsight.com for more information.